While Nokia already stop making smartphones, the brand remains to be one of the greatest company in the world in terms of innovations. Nokia’s 5G network infrastructure projects became the main priority of the company after they left the mobile phone industry. The latest acquisition and rebranding of French company Withings also marks the entry of the Finnish brand on connected health technologies. Ofcourse, we also heard about OZO, Nokia’s one of a kind Virtual Reality (VR) camera. All of these succoured the Finnish company to remain in the business after the horrible setbacks with their mobile division over the last few years. Last year, Nokia licensed a Finnish startup company called HMD Global to make Nokia-branded smartphones for the next ten years. The licensee promises to bring back the Nokia brand to where it used belong before. The stakes are high for HMD as many other smaller brands has taken over Nokia’s position in the industry after its absence for years but the company believes with their goals and if they are to ask, it will take them less than 10 years to become one of the top players. Then there comes the drones. The company’s plan for life saving drones isn’t actually a hidden project. If you are subscribed to Nokia’s YouTube channel (not Nokia Mobile), you’ve probably heard this before. The unnamed drones are missioned to save lives and it recently got a cool name. 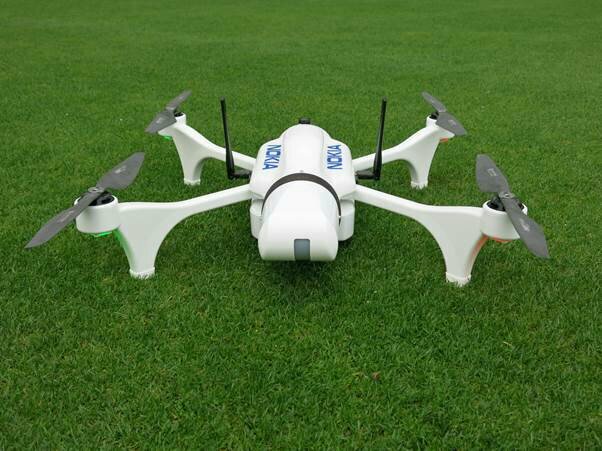 Nokia has registered the name “OVNI” with the European Union Intellectual Property Office as the name of its drones. OVNI is classified as telecommunications devices for civilian and military use and so it is unlikely to compete with your beloved DJI Phantom or GoPro Karma. The drones will mainly be used for search and rescue operations. OVNI is also paired with Ultra Compact Network System which allows the drone to be used as portable LTE network to get a fast video feedbacks from aerial search even if there isn’t any existing network infrastructure. The drones can also help industries like oil and gas for monitoring errors and report it back to headquarters. Thanks to Artificial Intelligence, OVNI can make site surveys for hours and send back information to site engineers for resolution. As mentioned, OVNI will not compete against your existing drones as Nokia seems to be taking a different path from let’s say GoPro and DJI. But Nokia has a long standing with consumer electronics and it seems a great idea if they incorporate their VR technologies with drones. And just so you know, Nokia’s drone won UAE Drones for Good Award last February. Yes, it won an award before it even got a name.